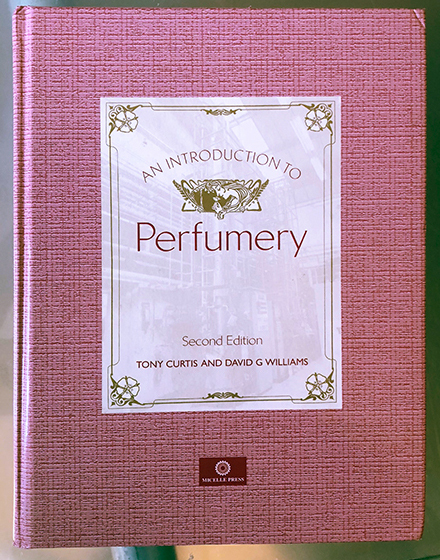 First published in 1994, An Introduction to Perfumery by Tony Curtis and David Williams, is a perfumer’s classic. Much of the large volume (778 pages) is dedicated to the business of large perfume companies. This holds little interest for me since Brooklyn Perfume Company is hardly on that level. But there’s plenty of interesting other stuff. The book starts with a section about the chemistry of fragrances. I find it helpful—I have a background in chemistry—and think anyone can figure it out. It helps olfactory memory because there are generic characteristics of such things as alcohols, aldehydes, esters, and ethers. One, first example, might recognize the fruitiness of an ester or the harshness of an aldehyde, important hints as to the compound at play. The two most important chapters for the perfumer are Aroma Chemicals and Materials of Natural Origin. There’s a rather lengthy introduction to these sections that explains the abbreviations used to describe smell. Another favorite are the lists of ingredients and how they function in a perfume. For example, the entry for Amylcinnamic aldehyde gives its odor strength on a scale of zero to six (it gets a two); shows an image of the molecule; lists its principle, secondary and background notes; describes its appearance; rates its stability; and shows where it occurs. Each entry discusses how and when the compound should be used. What may be most useful for the conscientious beginner are the descriptions of experiments that can be performed with a compound or natural. For example, under “Mimosa Absolute,” we find a suggestion for experimenting with equal parts Lyral and l-citronellol. Further projects are designed to train the nose of the beginning perfumer. The authors also included a section of floral “bases,” which are lessons in themselves and provide starting points for other interpretations. There follows a section, The Applications of Perfumes, that includes a section on emulsification—very useful if your scents contain water—and surfactants used to keep solutions clear. This whole section has been helpful for keeping BPC’s Eaux Fraîches, which contain water, from turning cloudy. The book also addresses skin-care products, lotions, creams and soaps. Very soon, we’ll dig deeper into this fascinating tome.